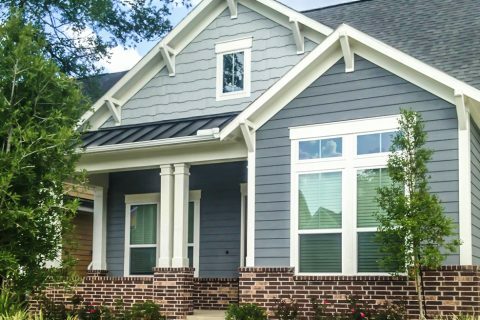 Fiber cement by James Hardie has earned a reputation for stability and a very low maintenance cost. It is also known as “James Hardie board siding.” It is made from a mix of wood pulp, sand, cement, and clay. The siding in fiber cement is much thicker than vinyl, and it has a better ability to withstand harsh weather effects such as strong wind or hail. The fiber cement material is considered to be very stable, and does not expand and contract at the same pace that a true wood siding or vinyl siding does. Fiber cement siding is built to mimic the look and feel of natural wood siding, as well as to provide less hassle, maintenance, and cost, including protection from insects. The stability of fiber cement allows paint to last longer on its surface; hence, a fiber cement coating does not require refreshing as often as wood siding. Fiber cement readily accepts paint. Most fiber cement manufacturers offer a wide range of factory-applied finishes. In addition, most fiber cement siding can be painted, so that an owner can change their design plans anytime they feel like it, without having to replace the siding itself. The demand for this type of siding has risen drastically due to its durability and low-cost wood alternative. Fiber cement is often compared to vinyl. These products both have long warranties, and they’re very visually appealing. o It is highly resistant to water and also fire proof. o Fiber cementing offers lots of options for texture and color. o It prevents from insects and pests too. o It has long durability and warranty. Want to find out more about our fiber cement siding installation services? Contact us now at (918) 855-7597 or click the quote button.